Translates better than the live version but even then it doesn't trump the original. 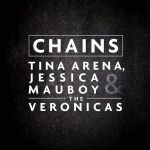 Chains is still an excellent song, and these ladies are all very talented, so this is very enjoyable, however I don't love these groupsing type things so I much prefer the original. Kinda eh. Not bad though. It does the original justice, but you can't really improve on perfection. The performance was quite a TV moment though. Awesome track, but the live performance at the ARIAs was absolutely incredible.